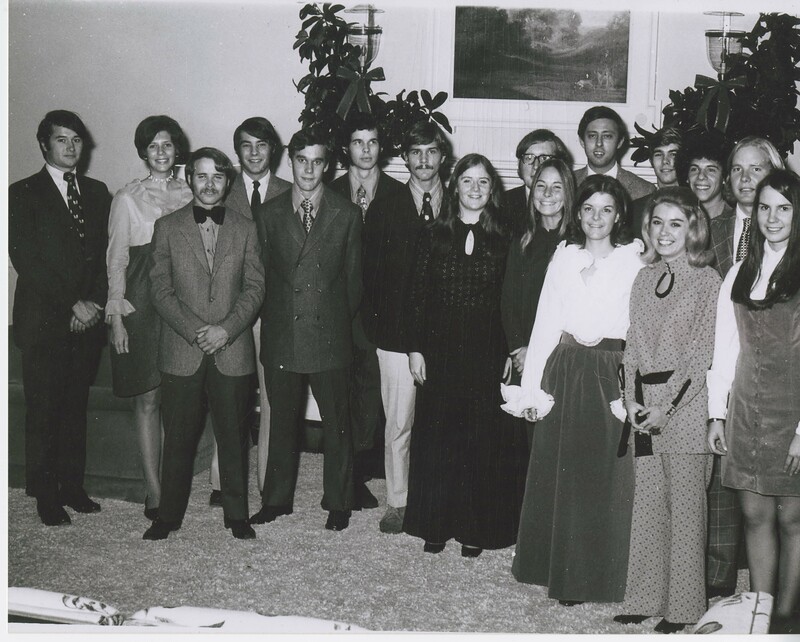 Photo of the 1970-71 Liberal Arts Forum. Front row L-R: David Marion, Brad Curran, Steve Leocha, Cathy Albair, Ann Shawhan, Beth Brinkerhoff, Carolyn Overstreet, Pat Jones. Back Row L-R: Bob Lane, Jan Davis, John Finch, Chris Walsh, Chris Butcher, Dr. James P. Elder, Bill Ogle, Mike Bunitsky, Frank Lyon. In 1958, the Student Government Association established the Liberal Arts Forum. The purpose of this student-led group was to promote the arts and humanities aspect of Elon’s liberal arts campus, and they encouraged curiosity through scholarly lectures. Only a few students and professors were involved in the forum at its beginning – these people being Etta Britt, James P. Elder, Daniel Gee, and Professors William M. Brown, Clarence Carson, Richard Haff and James Hess. While presentations by noted professors of the time were the primary events hosted by the Liberal Arts Forum, other occasions included art displays, films, concerts, seminars, and debates.In 1966, Elon College held its first annual “Humanities Week” where various speakers spoke about broad issues that were meant to spark further inquiry. Former President Gerald Ford, at the time the House minority leader, was the featured lecturer. The theme was “The Changing Image of Man.” Throughout the years, the themes ranged from “Democracy: Fact or Fiction?” to “Myth, Dream and Archetype,” to “Death and the Life Story.” Other honored guests included Richard Wordsworth (1979), the British actor and great-great-grandson of the poet; Spike Lee (1990); John F. Kennedy, Jr. (1998); and former Costa Rican President, Oscar Arias (2000). Numerous professors have also lectured at the week-long events in the midst of more than two hundred and fifty guest speakers. Today, the Liberal Arts Forum covers interdisciplinary subjects and continues to host speakers every year. They sponsor several of the events listed on the Cultural Calendar and remain funded by the Student Government Association. For more information regarding upcoming cultural events, click here. This entry was posted in Academics, Cultural events, Student organizations. Bookmark the permalink.